BOB KIRKWOOD, AROUND THE WORLD IN 80 HOLDS. THE LIFE AND TIMES OF A WRESTLING WORKER. BY DAVID GENTLE. Features editor Health and Strength. The title may well be a bit of an exaggeration, as most wrestlers can get by with far less than 80 holds. When wrestling was at its lowest ebb, some “matches” would not have had more than 10 different holds in total, and that’s counting the belly flop as one. Luckily, the sport had a far better run before the death knoll and hopefully its once again regaining its entertainment value. Entertainment always the goal of most wrestling matches, apart from a few shooting matches. Ridicule killed it for a while, but hopefully the fun is now back for the faithful, although the old timers must have more than a grin when they watch some of the more outlandish matches. The warning is there, don’t take the audience’s intelligence too much for granted. Some imported USA matches make you wonder who are the greatest idiots, the audience or the contestants. Despite what historians call the Golden Age of Wrestling, of matches between Hackensmidt , Gotch, The Angel, etc, I suppose because it is personal, the best of all times for me was the years between the late 1940s to the 1970s. The boredom of some styles of early ( and probably genuine shooting matches.) wrestling was solved by bringing in the so called All in style. 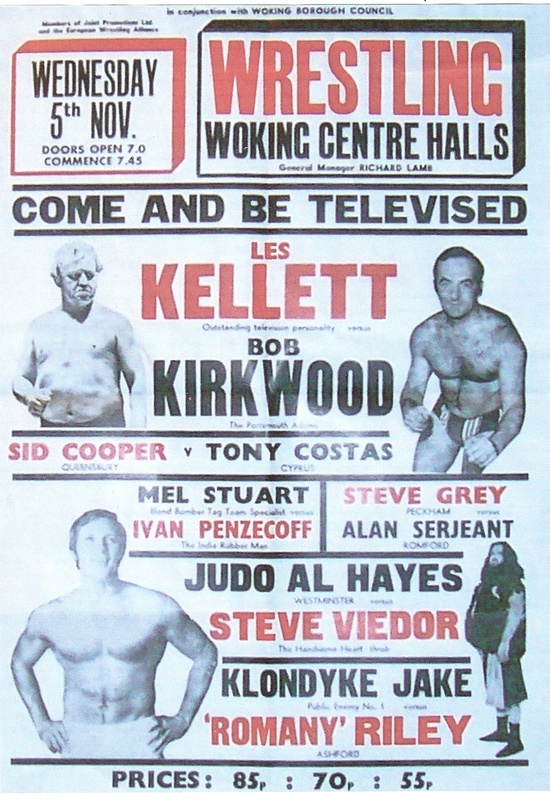 More faces were in the game, more skill was introduced and people were entertained, so much so, that Saturday night was not complete without watching wrestling, either at some of the many venues, or directly on the television, where many names were made as a result of Kent Walton’s commentaries and build up of excitement. In fact it was the lucky ones who really supported the matches. I know for a decade, it was my top day of the week. Wrestling had its stars, heroes, and villains, and all because of its faithful workers. One of the best of all, when wrestling was at its peak of fame was Bob Kirkwood, a handsome (I think that’s what he wrote?) former bodybuilder from Portsmouth Hampshire. At that period, he trained at the famous Bob Woolgar gym where the 1948 Olympic lifting had trained. 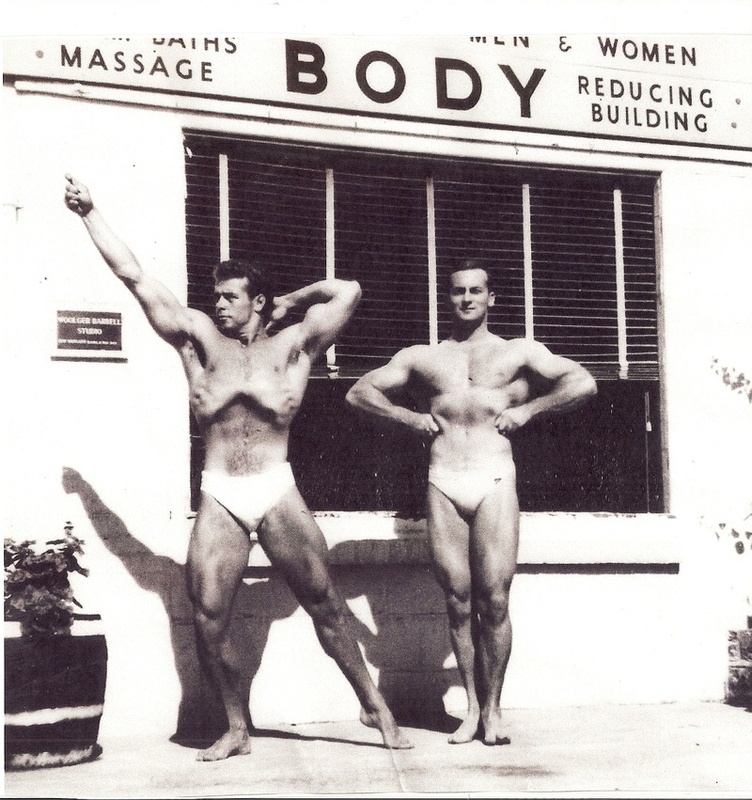 Later many more famous and household names also trained at the Woolgar gym, including the one and only Arnold scwarzenegger. At the time when all men of a certain age had to do National Service, Bob found himself posted to Singapore in the R.A.F. and with his physique, became a P.T. instructor, in the infamous Changi Camp, where he picked up and put into practice his wrestling skills. During his time out East, he met some amazing characters famous in the wrestling game, including Ricky Waldo, King Kong and the great American Lou Thez. 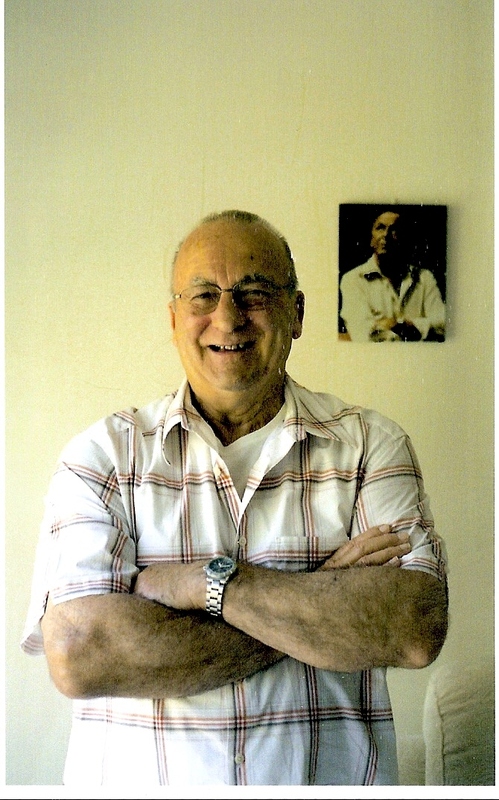 Bob visited Changi prison twice a week teaching the inmates weight training. .Although a qualified Aircraft instruments fitter, Bob spent more time on his wrestling and weight training. 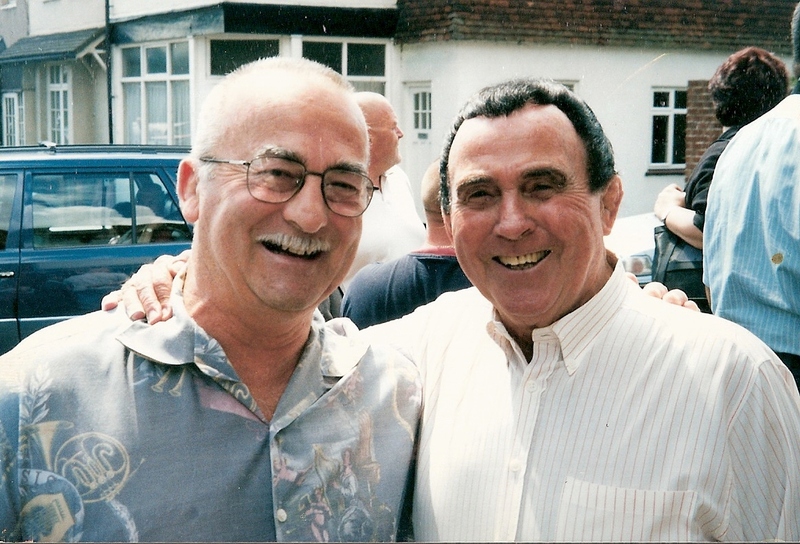 With his time served, Bob returned to Portsmouth and met Bruno Elrington, who put him in touch with promoter Ken Joyce. Ken started them both up in the mat game in early 1960. Any wrestler will tell you the game requires constant travelling. ( and a digestive system of steel ) Bob visited almost every town and city in the UK, punctuated by more exotic jaunts to foreign places such as France, Spain, Germany, Austria, Zambia, and several trips to both Nigeria and Kenya. Over a quarter a century of wrestling and travelling, Bob estimates he travelled all of two million miles, wearing out 23 cars in the process. Bob of course met many famous people and personalities. He actually trained with Arnold Schwarzenegger, Reub Martin, Gene Bohaty and John Yearsley and was personal friends with Spencer Churchill, Reg Park, Bob Paris, Lee Labrada etc in the bodybuilding world, plus his opponents in the square ring are almost a Whos Who of the mat game, including Paul Lincoln his wrestling mentor, Mick Mc Manus, Jackie Pallo, Les Kellett, Randolph Turpin, Freddie Mills etc. He also met the Duke of Edinburgh ,Jomo Kenyatta, Ken Kaunda and more. The special occasion when the top wrestlers of the day, met at the Royal Albert Hall on July 11th 1968 in front of HRH the Duke of Edinburgh in aid of the St John Ambulance Association and Brigade was certainly a highlight on the wrestling calendar. Those taking place at this unique event included Mick McManus,Jackie Pallo,Al Hayes, Steve Logan,Clayton Thomson,The Royals Bert and Vic, Les Kellett, The Dennisons, ie. Alan and Sid Cooper, and Bob Kirkwood. We know from reports that the Duke certainly enjoyed his night out, later meeting all the “boys”. After at least 5,000 bouts and what seemed like a lifetime in the mat game, Bob, like most of us, began showing signs of wear and tear, and with the introduction to T.V of what I can only call, “The Clowns”, wrestling began to lose its public interest, even losing its T.V. spot. So Bob returned to his other interest, the gym business, working for local authorities, and running sport centres up until 1995, eventually opening his own gym up until 2006. In 2005 he was presented with an award from The British Wrestlers Reunion, via Wayne and Sarah Bridges, for his services to wrestling. He also pays tribute to the many wrestlers we have lost over the years, most household names and heroes. Whilst not a collector as such, he does appreciate Ray Plunkett and others for their gifts of his past matches, bill posters, photos etc. Sadly he is not too overwhelmed with the modern over the top wrestling promotions as imported from America. His hobbies are working out in his home gym, drinking good wine, watching movies and most of all collecting Frank Sinatra memorabilia , Sinatra being his favourite singer of all times. When I asked Bob did he have any advice for those wishing to take up wrestling, and we both agreed there are some good new lads on the scene. He suggested they join a gym, build up strength and physique, learn the holds and skills of real wrestling, and most of all… “!Don’t give up your day job”. Thanks Bob for the interview and advice, see you at the next Reunion at the Bridges.